We’ve been hearing of increased incidents of targeted violence across the US, post elections. For South Asian and Arab communities and friends who are vulnerable, here are some tips from South Asian Americans Leading Together (SAALT). I’ll keep posting updates on some of the response mechanisms we’re all working on to put in place. Stay safe, and please pass these on to others in our communities. 1) SAFETY: Check up on your friends, family, and community spaces. Keep your phone charged, have cash on hand, take off your headphones, and be aware of your surroundings. During an incident, do your best to get to a SAFE PLACE, try to RECORD with a phone if you’re able, contact folks who can help ASSURE YOUR SAFETY (for some this may include the police), and then REPORT the incident. (2) HATE INCIDENTS: If you or someone you know is subjected to a hate incident, it’s important to address and report it. This can include things like name-calling, vandalism, school/workplace harassment, housing discrimination, or physical attacks. (3) HOW TO REPORT: If you encounter a hate incident (anything from name-calling up to physical assaults) targeting South Asian, Sikh, Muslim, and Arab communities, report it via South Asian Americans Leading Together’s online form. …or in other words, sorry for the interruption, and apologies for the month without posts. I was having trouble with the blogging software, and the resident techie wizard was busy with end-of-term-itis. It’s been a long hard winter of discontent and mute despair, in any case, with too many words raining down on me, and too few to articulate. My yahoogänger story, what’s yours? A few years ago, I found that some of my emails were going to another Anasuya, one who had a similar email address, but on hotmail, while mine was on yahoo. We ended up corresponding over the mistaken emails, and interestingly enough, found enough in common to be in touch through all these years… We narrowly missed meeting each other in person at a conference in Bangkok, but that didn’t stop us. In fact, we’re even connected on Facebook, which, as you all know, is now the only competent measure for any kind of social relationship whatsoever. I mean, I’m seriously thinking of disowning my parents because neither of them has an FB account; what legitimacy can someone have who isn’t updating their online status every two hours? However, that familial crisis aside, an interesting article in today’s New York Times on Googlegängers was what brought on this post. And if you tell me you’ve never done any vanity googling for your name and checked out whose extraordinary life (or lives) you’re competing against for page views, you’re integrity-challenged. I, for one, can tell you that the Facebook public listing of Anasuya Sengupta ain’t me; I’m the paranoid about privacy kind (yeah yeah, I can’t do anything about this blog now, can I? It has a peculiar life of its own and it terrifies me). Go ahead, my vain friends, tell me your googlegänger stories; I’m waiting with baited (sic) breath. Author anasuyaPosted on April 11, 2008 February 6, 2016 Categories Whatever3 Comments on My yahoogänger story, what’s yours? This photograph is a week old, but I can’t get it out of my head. Torrential rain, and Bangaloreans have to find innovative ways of staying afloat. sigh. Btw, this is a photograph of Hosur Road, taken by S Eashwar, Deccan Herald, 15 September 2007. Well, we did it. Unbelievably, amazingly so. We moved. Right now, I’m sitting in our ‘cozy’ (Bay area euphemism for tiny) apartment somewhere in Bezerkly, Caaalifornia. We moved from the city that was home for so many years, home both real and imagined, home both bliss and bane. Bengaluru. We moved for so many reasons, all practical, well-thought out, but it doesn’t help the goodbyes. Bangalore was getting really rough on my asthma (wait, the increasing pollution was actually one of the *causes* for my asthma), and the craziness of the chaos, the traffic, the change in lifestyles, in attitudes, in the Bangalore spirit, was moving beyond we-can-manage-this-because-we-love-the-city to we-might-love-it-but-we-can’t-cope-anymore. Even our time with the Koramangala Initiative (a citizen’s forum in Koramangala) made us feel that without sustained political will, well-intentioned citizens’ efforts can feel frustrating rather than empowering. Also, it’s been ten years of working for both Ashwin and me, and we felt the need to reflect on those ten years, and to challenge ourselves in different ways for the next ten. So Ashwin chose to go back to university (‘school’ as they call it here in the usofa), and I chose to finish that darn, never-ending doctoral thesis of mine. All good reasons. Still hard to say goodbye. So I’m going to resort to what I know to be true: misquoting Bob Dylan always works. Goodbye’s too sad a word, babe, so I’ll just say fare thee well. Besides, as the Governor of our newly inhabited state (Arnold Shivajinagar) is fond of saying, I Will Be Back. And he’s just following namma Bharatiya samskruti, where you never say ‘I’m leaving’, you always wave tata and say, ‘Bartheevi’, ‘Aashbo’, ‘Varen’, ‘Aathe hai’. We’ll be back. Bartheevi, Bengaluru. In the midst of craziness and chaos, some chuckles. As Ashwin says, it’s a tribute to my pun-tastic family. What better way to celebrate Republic Day, than with a morning raaga? Venue: Chitrakala Parishad, Open Air Auditorium, Kumara Krupa Road, Bangalore. While early morning raagas are serene, tranquil and meditative, according to the time specificities of Hindustani classical music, we tend to miss out on them at evening concerts. Sanjeev Abhyankar is considered one of the finest exponents amongst the younger generation of musicians. LIFE AND TIMES OF BANGALORE AT THE TURN OF THE TWENTIETH CENTURY – a collection of postcards of the city as it was at the turn of the 20th century. 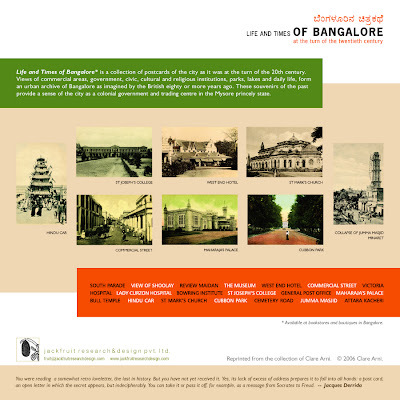 Views of commercial areas, government, civic, cultural and religious institutions, parks, lakes and daily life, form an urban archive of Bangalore as imagined by the British eighty or more years ago. These souvenirs of the past provide a sense of the city as a colonial government and trading centre in the Mysore princely state.